1960: The NCR390(R) computer was designed and built, and was in worldwide use in banks and accounting departments during the 1960s and early 1970s. It was the world’s first, low cost, mass produced computer. 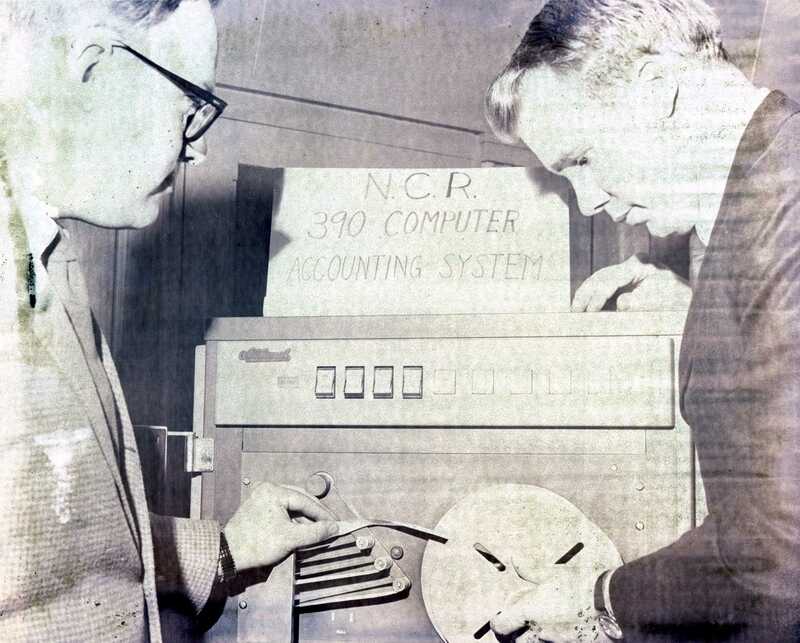 Unidentified college faculty members demonstrating NCR 390 Accounting Computer, 1968. 1965: Honeywell Corporation introduced the H316 “Kitchen Computer”; it was offered in the Neiman Marcus catalog for $10,600. 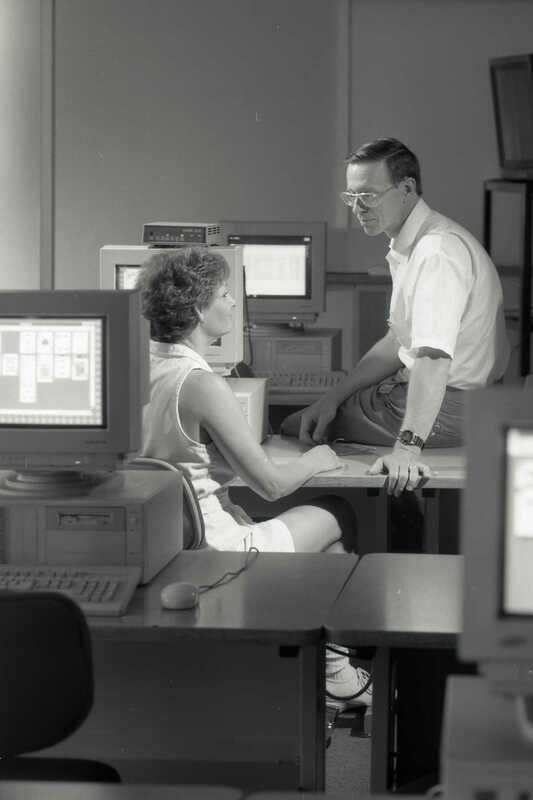 In 1968, Cincinnati State purchased their first computer from the Honeywell Corporation. 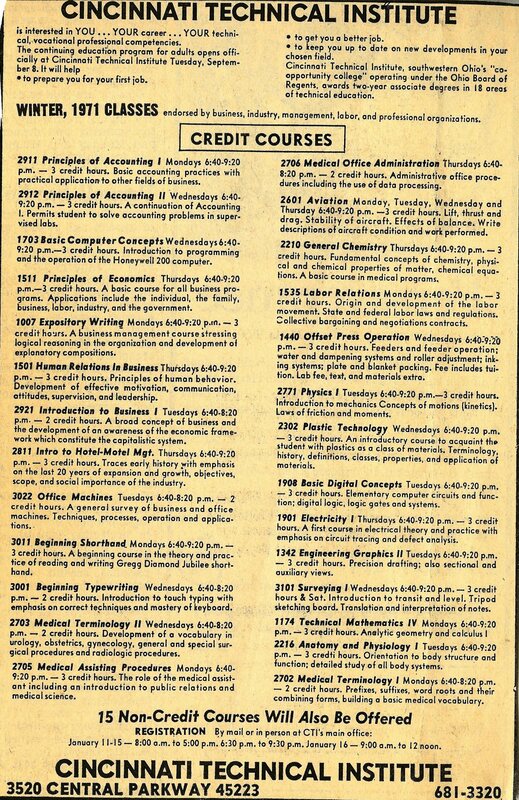 1966: the Cincinnati Cooperative School of Technology opened its doors, offering course in 4 programs: Sales Marketing Technology; Graphic Printing Technology; Business Data Processing; Mechanical Design. 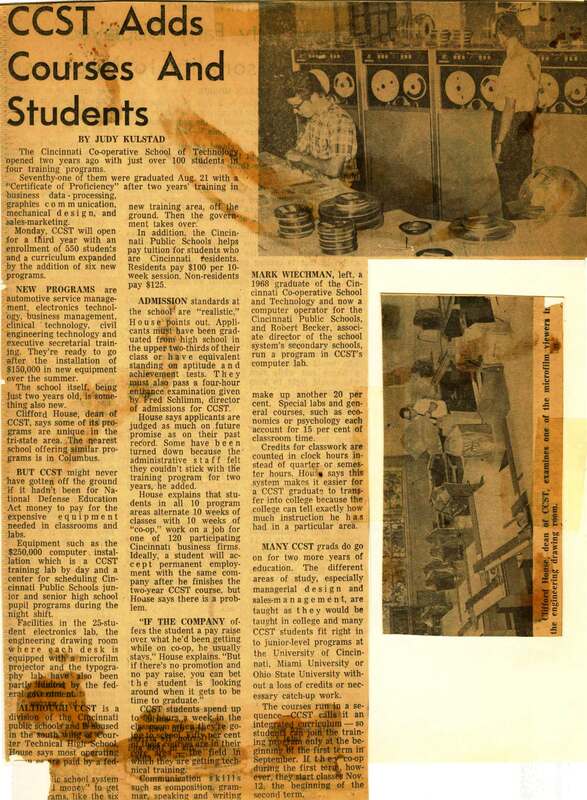 This reel shows the delivery of the school’s first Honeywell computers for the Data Processing program, in 1966. 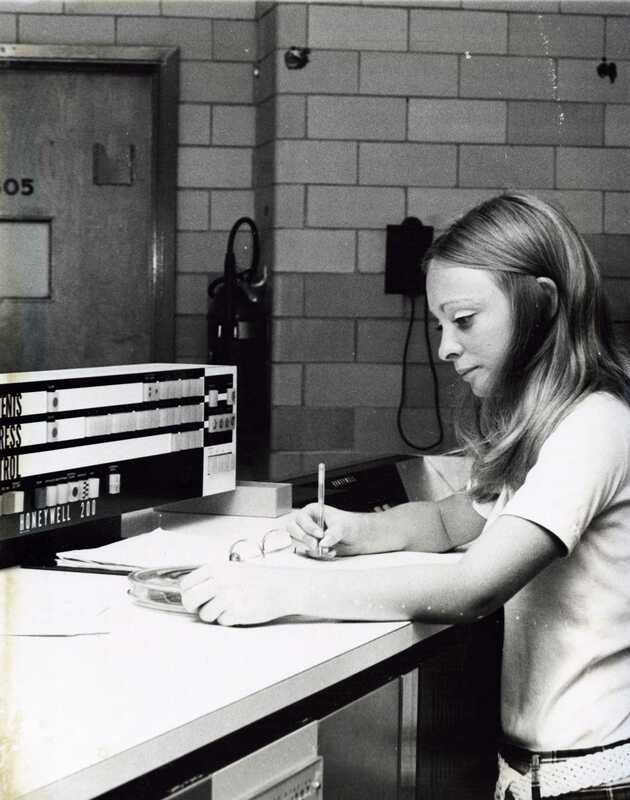 Unidentified student in the Business Data Processing program with the Honeywell 200, undated. “One Time Porter Now Operates a Computer”, Cincinnati Post, April 2nd, 1968. 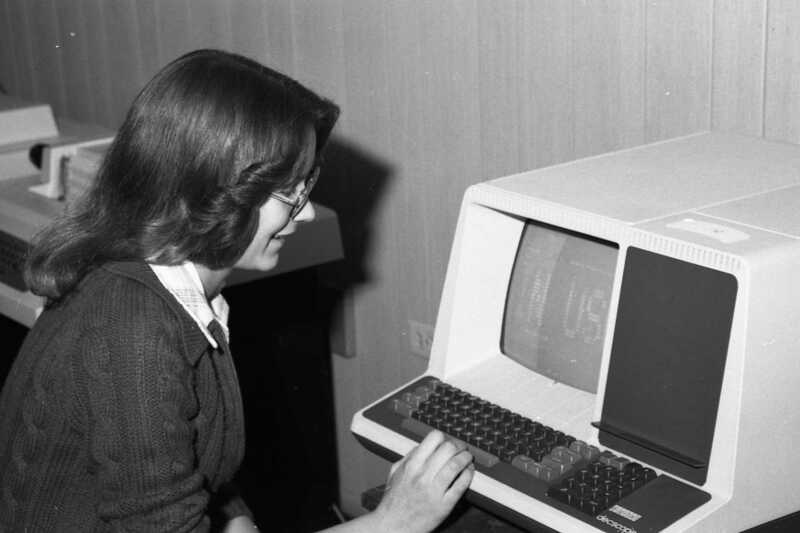 New career opportunities became available to men and women as computers became more affordable, and technical schools began offering training in them. An education, and a good job, were suddenly within reach of many more people than ever before. 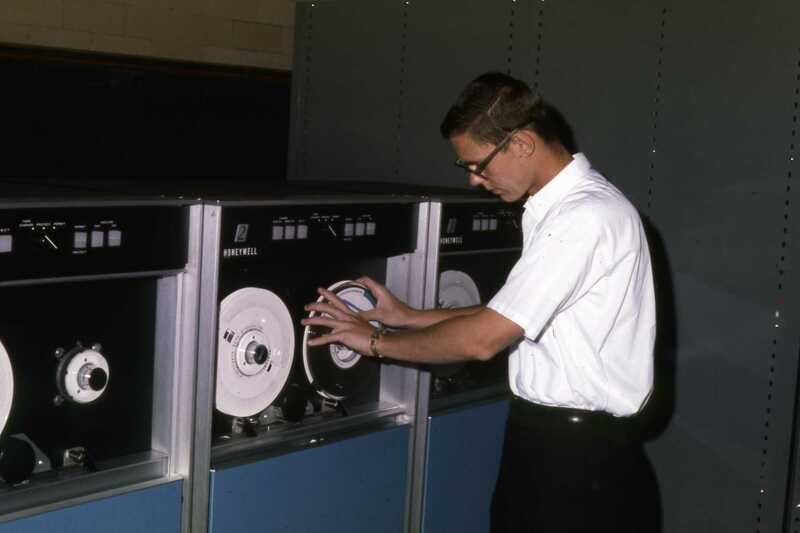 1968: CCST installed a $200,000 Honeywell 200 computer to train students in data processing. 1969: ARPANET, funded by the Department of Defense, was the first operational packet switching network, and would become the core network of the global Internet. 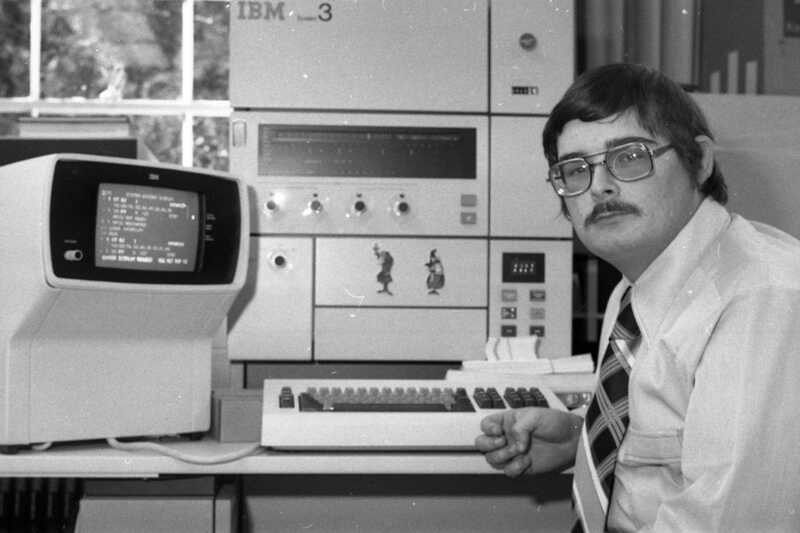 1970: The UNIX operating system was created at Bell Labs. 1972: 5 1/4 inch floppy disks were introduced, making it easier to store and move data, and Cincinnati Technical Institute became Cincinnati Technical College after an Ohio Senate bill recognized the collegiate nature of the school. 1975: The first commercially available microcomputer, the Altair 880, is the first to be called a “personal computer”. Unidentified student at a Decscope terminal by DEC, ca. 1977. This machine sold for $1,350 in 1980. Today, that would be over $3,700. 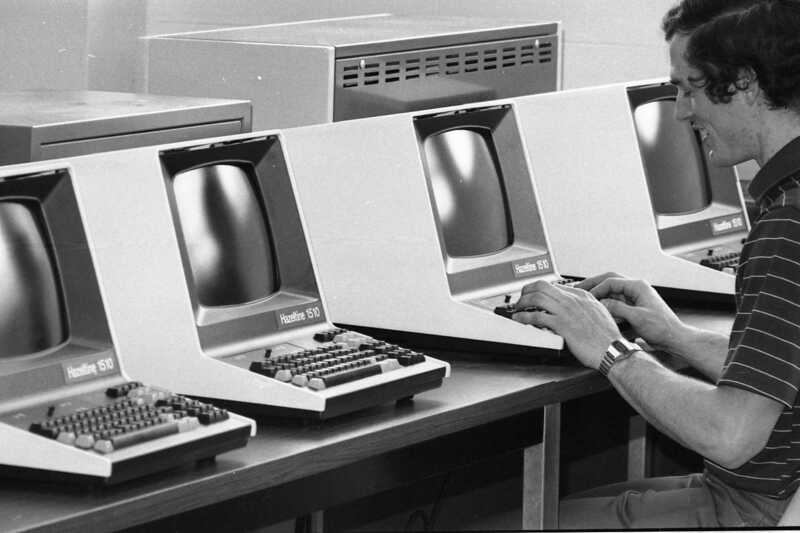 unidentified student demonstrating one of the school’s new computers, the Hazeltine 1510, ca. 1977. The Hazeltine 1510 terminal was an upgraded version of the Hazeltine 1500 terminal and was introduced in June, 1977 for $1,395. 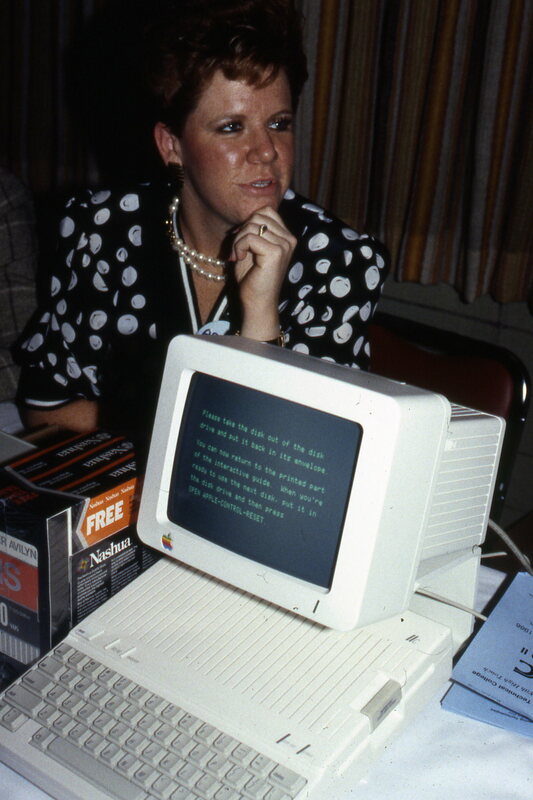 1976: The Apple I, a less powerful, but simpler and more affordable computer than the Altair 880, is released. 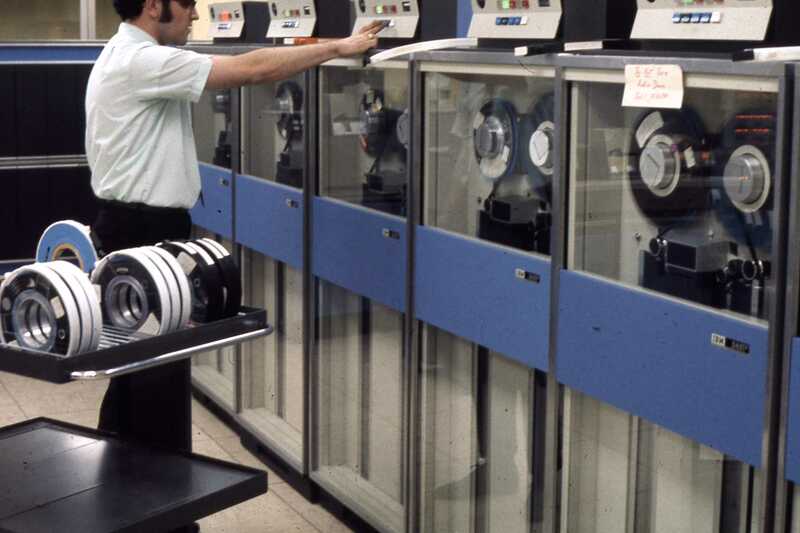 In the same year, the first laser printer, the IBM 3800, was introduced. 1978: The Johnnie Mae Berry Library, then the Learning Resource Center, opened its doors, and the Laser Optics program, the first of its kind in Ohio, was introduced at Cincinnati State. Intel released the 8086 microprocessor, a 16-bit chip faster and more powerful that seen before. 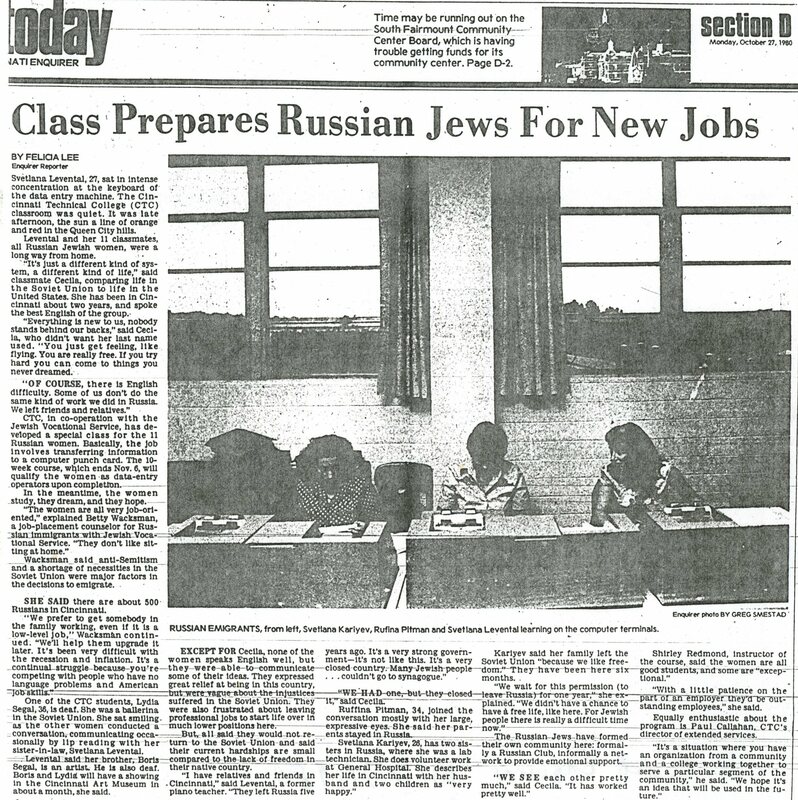 1981: CTC turned to private industry for financial support for the first time with the launch of the $1 Million Select Campaign. The goal was exceeded in 1983. The money was to be used to replace outdated technology. 1982: Time Magazine declares the personal computer to be “Machine of the Year”. 1985: Windows 1.0, featuring the first graphical user interface, is introduced by Microsoft. 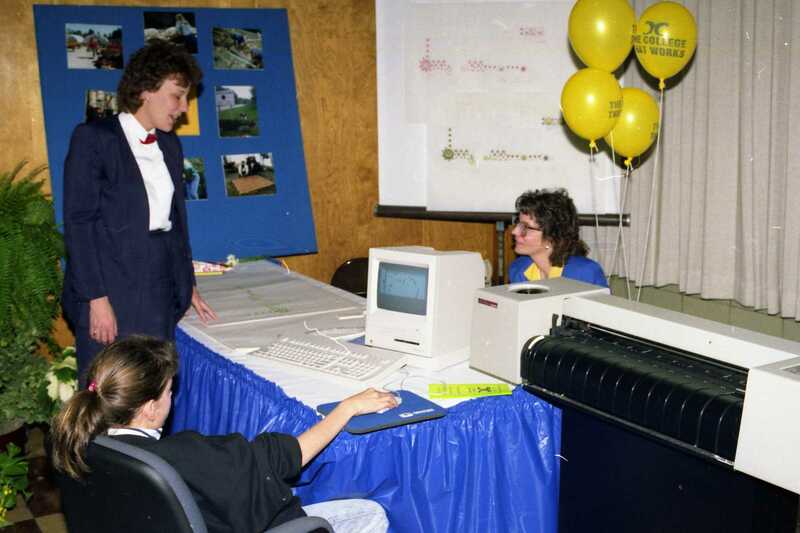 1987: CTC gave away an Apple IIc as a prize at Expo II. Apple IIc was Apple’s first attempt at a portable computer. That’s a long way from the iPad! Listen to the radio advertisement for the event below. 1989: Tim Berners-Lee proposed the World Wide Web project to CERN (European Council for Nuclear Research). 1991: The World Wide Web was first made available to the public on August 6. 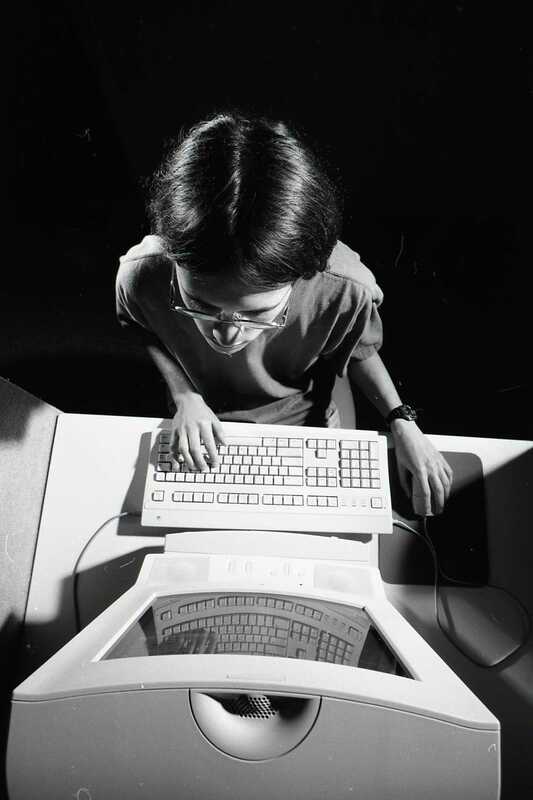 Computers provided new learning and career opportunities for many “non-traditional” students. 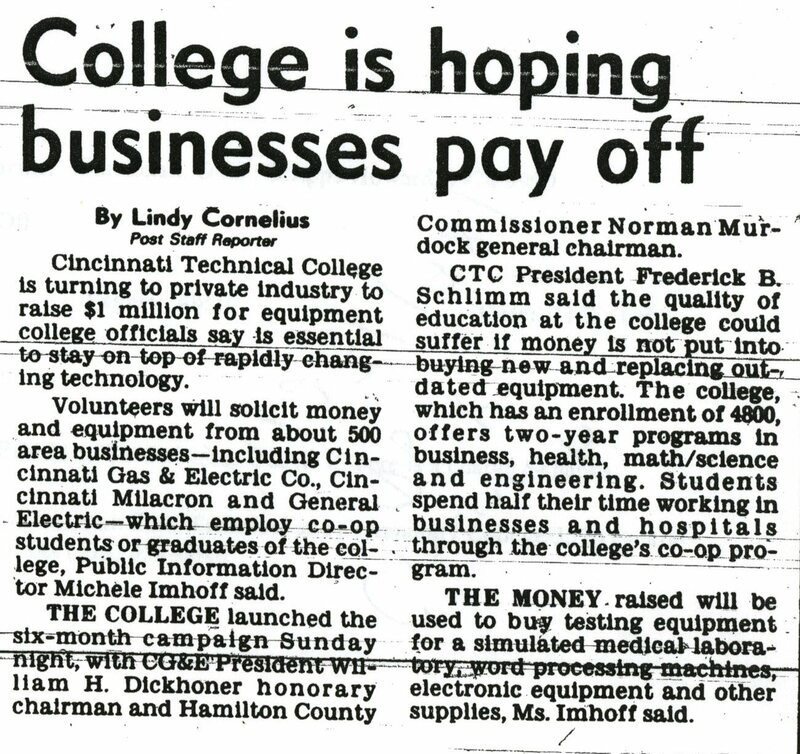 1993: The Board of Trustees of Cincinnati Technical College voted to convert CTC to a state community college. The name was officially changed to Cincinnati State Technical and Community College in 1994. Intel’s Pentium processor was also released. 1995: Windows 95 was released, and eBay was formed. 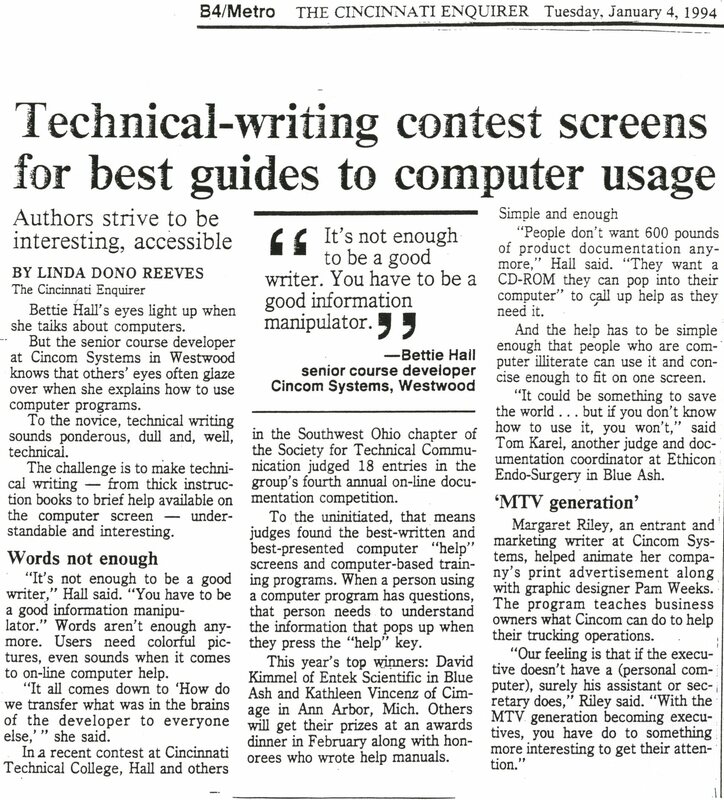 Article from the Cincinnati Enquirer, January 4th, 1994. Technical schools were instrumental in supplying the skilled workforce of the late 20th century. The proliferation of new technologies meant a need for new workers. 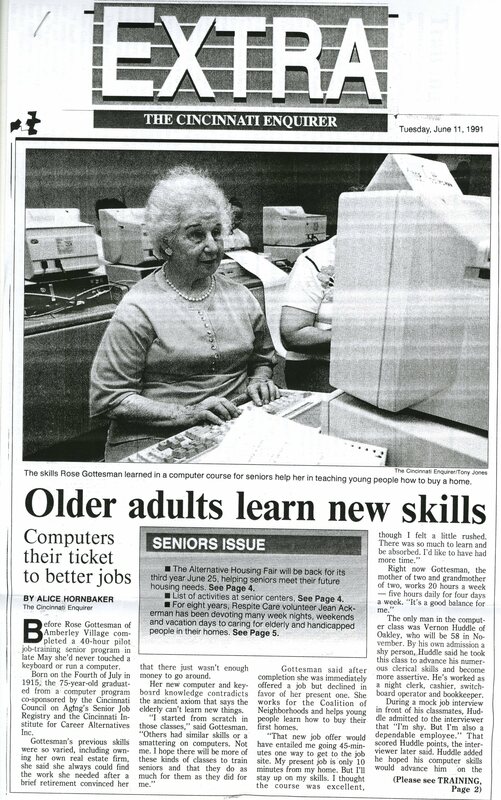 Cincinnati State wouldn’t have their first website until after the library built theirs in 1997. Nice work, Natalie and Tracey! Nice job. Bob Coil, CIT, is in the last photo with the male student in the 1994 pic.